My 23rd birthday was probably the most low key birthday I have ever had, but one of the most fun. I celebrated with some of my nearest and dearest at Tramp Stamp Granny’s in Hollywood. The bar is known for its live music played at the piano and what they call “upscale debauchery”. If attending on a night they have a cabaret expect to pay a $5.00 cover charge, which is still very low for covers in LA. Most nights do not have a cover and offer a great ambiance to enjoy great cocktails and very talented musicians playing top songs from any decade, or any song you want to request. The night that we were in attendance was a special 90s cabaret for the single release party of Elizabeth Woolf, who was also celebrating her birthday. Our group snagged a table in the front corner and stayed put most of the night enjoying covers of some of the most iconic songs from the 90s, including Wannabe by the Spice Girls (we may have provided a little back up to the ladies singing on that one). Though the 90s cabaret was a special night this Tuesday, it is a monthly occurrence called Slapbracelet. In addition they have an almost weekly Disney Night and a once monthly Queer Cabaret on Mondays. You can find out what is going on daily by clicking here. One of the most fun parts of going to TSG on a theme night is dressing to the theme! Being the 90s baby that I am, dressing to the theme was a fun treat for all of us, and super easy to do. I can’t wait for my friends and I to go on a Disney Night, I’m thinking I’ll try and go as Cruela DeVil or Edna Mode. Let’s talk about my outfit for my birthday, shall we? I wanted to go as 90s as I could without going to far out of my comfort zone. Some of the biggest trends in the 90s were; denim on denim, flannels, Adidas, scrunchies, chokers, big hoops, and fanny packs… so why not combine all of them into one outfit! The only way my outfit could have gotten even more 90s would have been to swap out my skinny jeans for a looser fitting boyfriend jean. 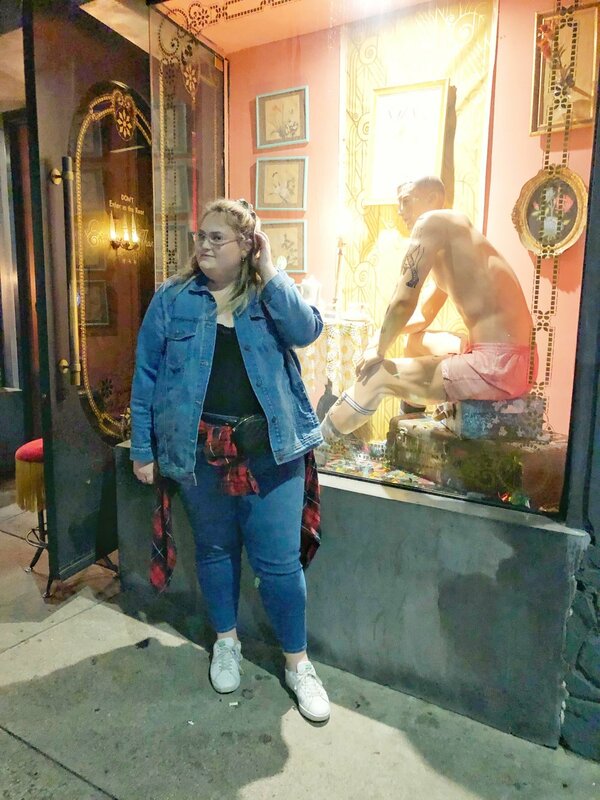 I started with a pair of skinny jeans from Torrid and went from there adding; a black body suit from ASOS, a red flannel from the mens section at ASOS, and finished off with a denim jacket from Old Navy. 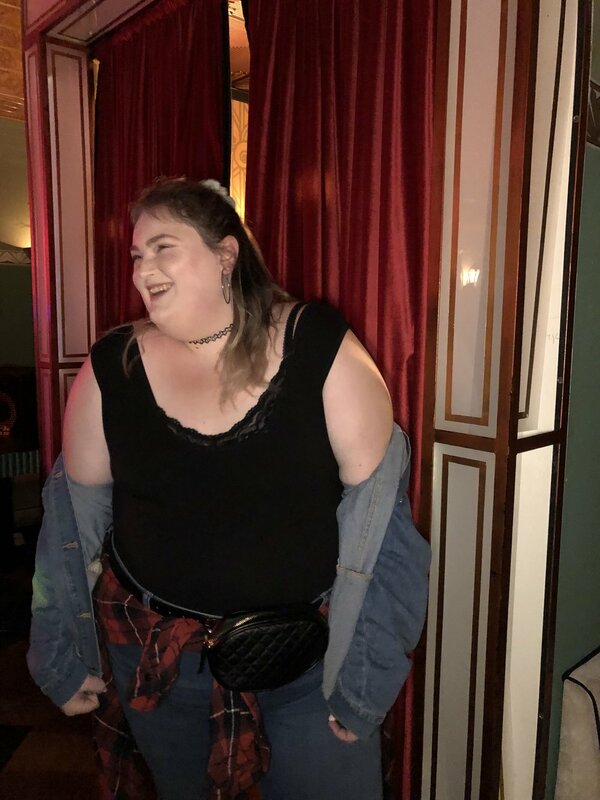 I accessorized this look with; a scrunchy I bought in Sydney, a choker from icing, hoops from Charming Charlie, and a fanny pack from Torrid. For other outfit inspiration check out my friends looks. Other items that were really popular in the 90s were overalls, knee high socks, black slip dresses over t-shirts, and combat boots. Other trends that were not worn by any of us would be; fishnet tights, animal prints, and bright colors. As a blogger or social media influencer, my brain is often thinking about how to get the best picture for the gram. Along with those thoughts I always want to come up with new backgrounds for a Photo Booth. Last year I had one that was made of tons of ribbons which ended up costing me about $80.00, but this back drop ended up costing me about $5.00. At target, there are three area that are the best for cheap and easy backdrop finds. The first is the dollar section at the front of the store, they often have small trinkets or signs that make good props in photos. Next there is the holiday section, if you are looking for a back drop for a holiday party this is your best bet at finding something festive. Finally the birthday section, it is where you will find WRAPPING PAPER, the best and cheapest background you can get. To make this sprinkle and gold stripped background all I did was put a tube of wrapping paper on my background stand. This is one of the best tips I can give anyone who wants a photo booth for any occasion. Check out this playlist below of songs that I think embodied this birthday for me, mixed in with some of my favorite 90s songs that were sung and played at TSG’s 90s cabaret. Thank you to everyone that I celebrated my birthday with and to everyone that reached out through social media. I can’t wait to see what 23 has in store for me and to bring everyone else along for the ride. Catch you next week when I post my winter lookbook.